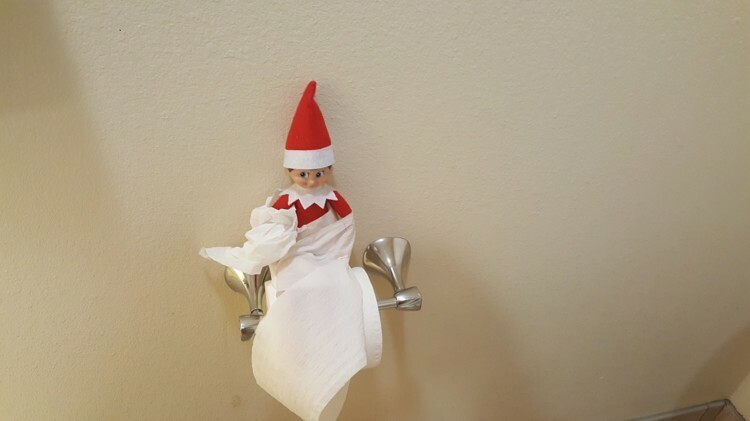 Does your family participate in the Elf on the Shelf phenomenon? We all know the drill. Elf on the Shelf drops in, causes havoc and reports back to Santa. The thought of Santa knowing all their daily ups and downs can make even the most mischievous child behave. But that little guy or gal can throw a wrench into holiday travels plan. 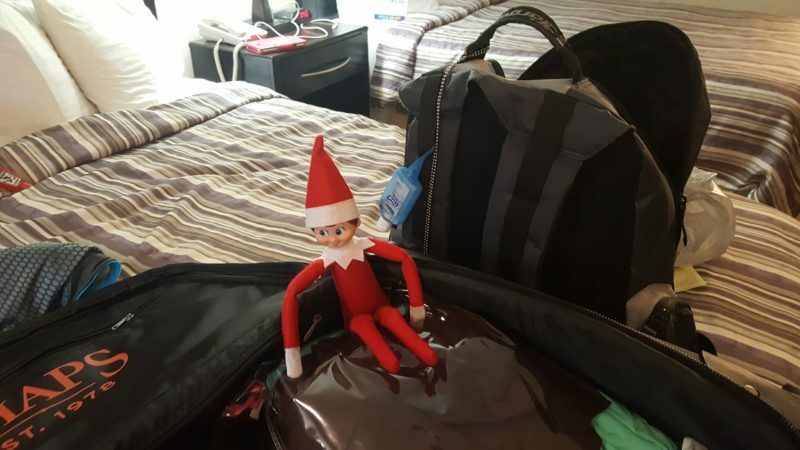 These tips can make traveling with your Elf just a little bit easier. Narky Norman usually arrives the day after Thanksgiving. That is if I remember to grab him out of the closet before I hit the stores for Black Friday. Er, I mean, if his flight from the North Pole doesn’t get delayed. So we have come up with a few ways to work Narky into our holiday travel plans that doesn’t cause too much chaos. 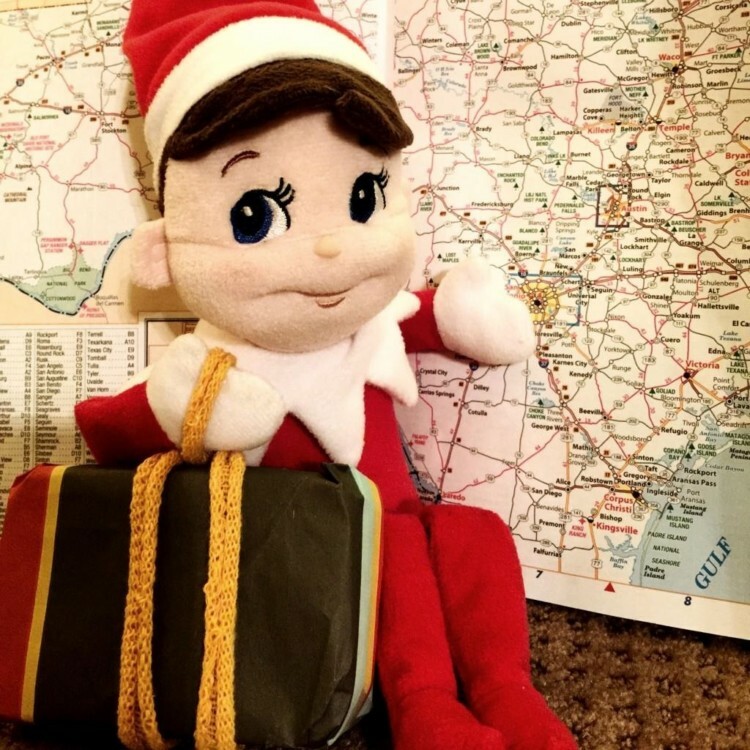 With all the holiday chaos, we have come up with a few ways to work elf on a shelf ideas into our travel plans without causing too much chaos. Since kids can’t touch the Elf on the Shelf, it’s best if he/she travels back to the North Pole during any travel time. This prevents the emotional breakdown from Suzy when Elf has to ride on the conveyor belt during airport security screening. It also can stop those sneaky little hands from being tempted to touch him/her while on a road trip. You thought Suzy’s meltdown about the airport screening was bad. Imagine Johnny’s fit when you have to put Elf in the suitcase in the back of the car. Yep, it’s much easier for Narky Norman to travel back to the North Pole while we’re on the road or in the air. Don’t want to travel with your elf? This is where you can give him/her the boot till next year. Just tell those questioning kids that Elf has gathered all the information he/she needs and is on his way to give his final report back to Santa. How Will He/She Find Us? Oh, the age old question that you already answered in regards to Santa. Well, hello Elf on the Shelf is best buds with Santa, so if the big guy can find you so can the elf… A little creepy of you think about it. If you are visiting family, ask if you can ship your elf in advance. If they are brave enough to say yes, ask them if they would set him/her up before you arrive. Nothing will reassure the kids more that Santa will be able to find them if Elf on the Shelf is there waiting for them. Not visiting family? Don’t pack your elf in the bags you are checking at the airport. Oh, can you imagine if your luggage is lost and Elf on the Shelf never shows up? 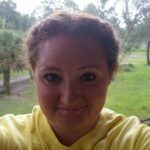 Trust me you don’t want to be running around trying to replace your elf on your vacation. He/she is much safer in your carry on. If your elf likes to get into everything, make sure to have some ideas lined up before you pack your bags. Nothing will tip off a child faster than an attitude change in your mischievous elf on a shelf. Wrap him up in toilet paper like a Christmas mummy. Bring small toys or other gifts and leave a note from Elf on the Shelf. Have Elf rummage through the clothes in the suitcase and make a small mess. Play hide and seek. Put your elf in the closet or even in the safe, if there is one. As you’re leaving the hotel room, pretend you forgot something and set him/her up watching TV or playing in the sink. It’s always emotional to say goodbye. Elf on the Shelf goodbyes are no different. Best bet is to try and keep as close to your non-traveling send-off tradition as possible. 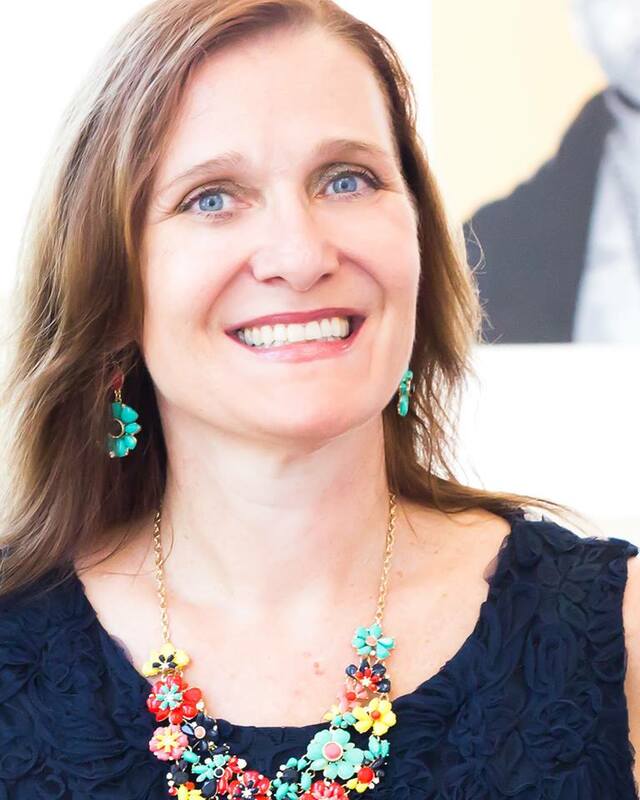 This can be tricky, but we want to prevent any unnecessary emotional outcries. Our tradition is to put Narky Norman under the Christmas tree on Christmas Eve along with Santa’s plate of cookies. When visiting family, this is easily accomplished and everything is right in the world. But obviously, that isn’t going to happen while in a hotel room. Early preparation is the key. If your child is old enough, talk it over with them and see if they have any fun ideas. Maybe get one of those miniature trees sold at Christmas time. Set it up on the little table and give your elf a traditional send-off. Or have your child write Santa a note thanking him for sending Elf on your vacation with you and leave him in one of the hotel room chairs. Better yet, have your kids draw Christmas tree pictures to tape on the wall and put your elf under them. Probably the easiest is to have your elf extend his stay with you until after your trip home. What Elf on the Shelf doesn’t love a little rest and relaxation? 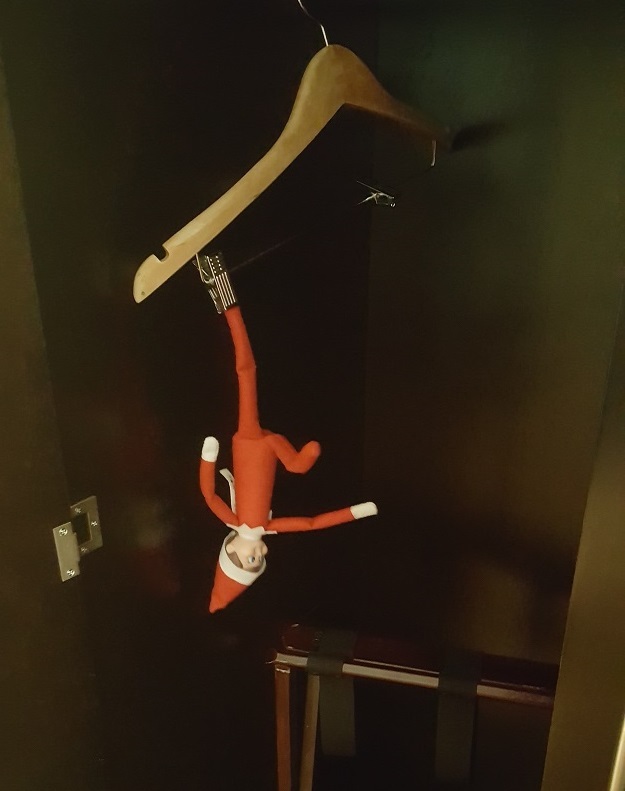 Your elf is now off duty, so no need to do crazy pranks every night. Just set him/her up with a good book and call it a year… Until it’s time to pack him/her up and then pull out the ninja moves again. Traveling during the holidays can be stressful. Add in a pesky little elf and it can be down right daunting. But with a sprinkle of organization, dash of planning and pinch of ingenuity you’ll be cooking up a jolly good time with your Elf on the Shelf! Previous Post: « Sonnenalp Hotel: European Getaway…in Colorado! 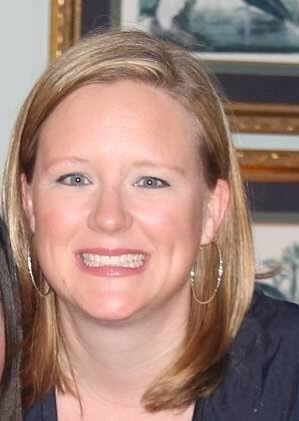 Great article Renee! 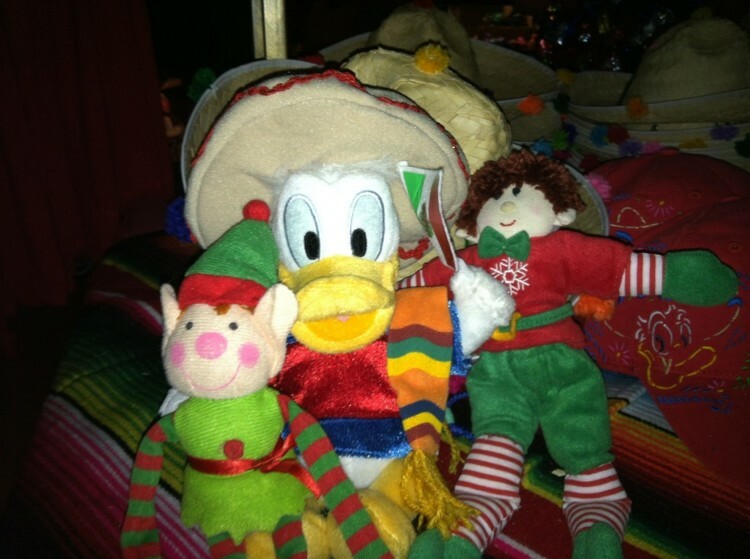 We have traveled with our Elf several times and yes, daunting is a great word to describe it. Great post! A little bird told me that Egon wants to hitch a ride on our Disney trip this Christmas. 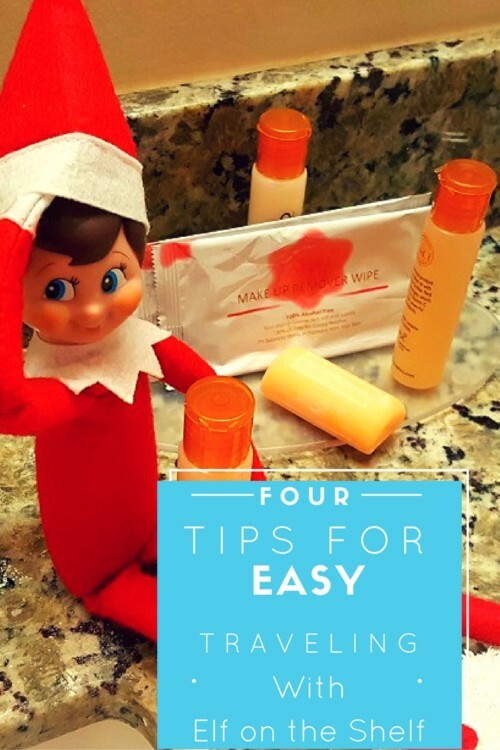 These are really great tips…our Elf traveled with us last year and we have a couple things in the books for this December…I guess the elves are coming along again!